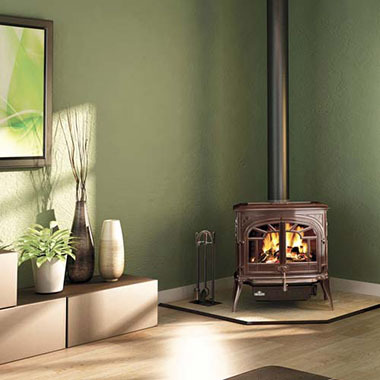 The two types of wood burning stoves we offer are of the insert and free-standing variety. 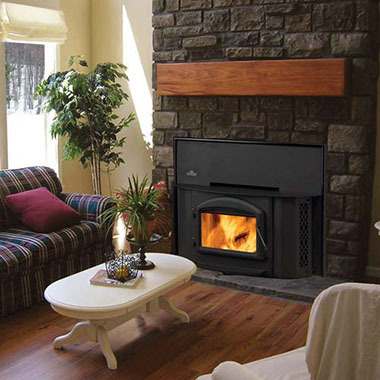 An insert stove is one that is installed in an existing fireplace. This insert style stove would have a stainless steel liner hooked up to it and run to the top of the chimney to create the proper draft. Insert stoves often are equipped with a variable blower fan and come in many styles with many options. A free-standing stove is one that has visible stove pipes which run into a masonry flue (usually 8"x8" square tile) or a Class-A chimney. These also come in many styles with even more options like ash-drawers, different style legs, and trim options. Naturally we make sure that when we install a stove all clearances and codes are met and that the liner installed is the right size and material for the stove. But what separates our service from others is before we even recommend a particular model to our customers we consult with you first going over an array of models. We look at your home, how you plan to use the stove, if you want to move the heat to other parts of the home, your budget, options you're looking for, and of course we find a style that suits your particular tastes. We often find that customers are sold a larger stove than needed for their home. To operate the stove at proper flue temperatures they would quite literally cook themselves out of the home because the stove itself is then to hot. We try to find a balance for our customers ensuring they will have a pleasant burning experience while also staying safe with flue temps in the appropriate range. Lastly, we make sure that you have the correct accessories to compliment your new stove. Be sure to check out our web store to see our complete accessory product line. Although we are happy to install any brand stove we have found Napoleon brand stoves to be quite reliable, easy to use and install, efficient and safe, and thus have become our stove of choice to offer. You can view their free-standing offerings and their insert offerings on Napoleon's website. We recommend selecting a few models you may be interested in so we can take that information and try to narrow down one stove of the available options to suit your home and your needs. Napoleon’s advanced EPA wood burning technology gives you more heat with less fuel. The easy operation of a single lever burn control regulates primary and secondary air establishing a perfect mixture and providing a clean burn. Economical 6″ flue assures you of efficiency and cost saving installations. Fully lined refractory firebox acts as a kiln, concentrating the maximum amount of heat to efficiently heat your home. Non-catalytic high tech design eliminates the need for a delicate ceramic catalytic combustor which can deteriorate over time. Large viewing area through an elegantly arched cast iron door. Air wash in combination with high temperatures keeps the viewing glass clean. Once you have researched Napoleon stoves and are ready to purchase, if you have any questions, or if you would like to have a consultative meeting please head over to our contact page to get in touch with us.